Bernard George Turner was born on 28th November 1893 at The Gables, Bledlow Ridge, Bucks, the son of John William and Emily Turner, an elementary school teacher. He was a boarder at Lord Williams’s Grammar School, Thame from 1908 and also attended High Wycombe Grammar School. After leaving school he gained a position with the London County Council and served as a clerk with the Fire Brigade. 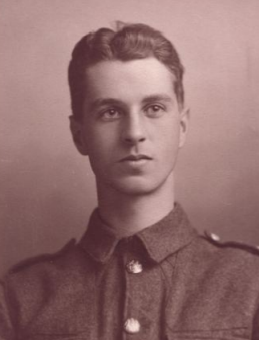 Bernard joined the Coldstream Guards as a Private 11833 in September 1914 and served on the Western Front in the Maxim Gun Section from January 1915. He was shot through the heart and killed aged 21 at Hill 70 at Vermeilles during the Battle of Loos on 27th September 1915. 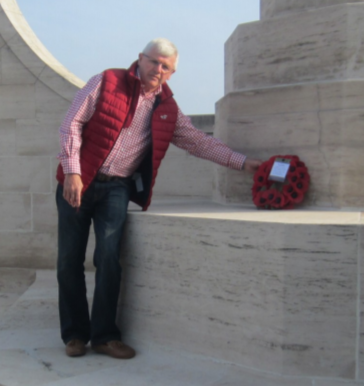 He has no known grave and so is commemorated on panel 7/8 of the Loos Memorial, Pas de Calais, France. He is remembered in Bledlow Ridge church war memorial and on the Lord Williams’s School and High Wycombe School honour boards. The photograph of him is from High Wycombe Grammar School records. The CWGC record him as son of John William & Emily Turner of 2 Balmoral Avenue, Sandylands, Morecambe.